And, it seems, kissing a man in Regency London has consequences! What Grace considers normal behaviour scandalises Regency society and so far she’s provided the irrepressible gossips of the ton with a season’s worth of conversation! In a scramble to protect her reputation, as well as his own, Jasper insists that they marry for the sake of her honour. Marrying Mr Darcy might be a 21st century girl’s dream – but the reality is far from romantic. Corsets are uncomfortable, no running water is disastrous! Grace had always planned on falling in love before she got married, but when Jasper takes her in his arms she just might believe she’s finally found her very own Prince Charming. 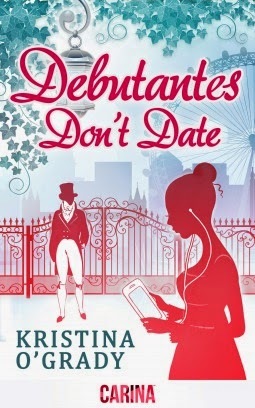 I kindly received Debutantes Don't Date in exchange of an honest review via Netgalley. Since I started blogging last year I've read quite a lot books published with Carina UK. I was never disappointed, they have some really great authors in their boat. They always do a fantastic job creating those wonderful covers. I was totally amazed by the cover when I saw it for the first time. Just so stunning! Uh well, I am not saying this was a bad one but I didn't loved it either. I struggeld with it. Starting with the issuse that the title of the book cannot keep it's promise. You get a wrong impression of it. Unfortunately dating is not mentioned in this book at all. Everything about Grace and Japers relationship is too rushed. Meeting in the first second, making out in the other. Without knowing each other getting married and living the happy ever after? No. The main character lacked of personalitly. Grace was either crying or horny when she saw Japsper. Grace and Jaspers relationship is based of lust. I wish there has been more than that. The tension between them felt not real. I like it when a story is told out of different point of views but here were a jumping from one charakter to another. This was very confusing from time to time. Also I noticed some lack of researche. Well, just saying Ryan Gosling is not tall and dark. I really liked the concept of the book. The story is unique. I liked it fot the fact it was different. I have never read anything similar to it but I expected a lot more of it. I am not sure I'd recommend this one. Every reader has it's own opinion. It was not for me but maybe for somone else.